In the 1960s, the day octopus, called heʻe in Hawaiian, was common and plentiful where we lived and fished along the North Kona coast of Hawaiʻi island. My kūpuna (elders) would recognize the heʻe den by the broken crab and snail shells found outside the entrance. Growing up in a fishing family, we were taught to take care of the land (ʻāina) , the ocean (moana) and to respect Kanaloa “ke akua o ka heʻe – god of the octopus.” Our first catch would be returned to the ocean in honor of Kanaloa. and serves as a cultural advisor on the Kona Coast of Hawaii Island. The Hearts Inside - How Many Do Octopuses Have? It’s a science fiction trope… A few soldiers walking down a dimly-lit spaceship, weapons drawn, as unsettling splatters of blood cover the walls—only some of it red. The blood that circulates in our bodies has a cultural significance that is difficult to overstate, its deep scarlet hue being used to imply everything from rage to romance to power. Perhaps this is why differently colored blood is used to show that the very essence of alien beings is completely foreign to the human experience. What you may not know, however, is that these aliens walk—and swim—among us. Many invertebrate animals have blue blood, and octopuses are no exception. Our blood is red due to the protein hemoglobin, more specifically the iron contained within hemoglobin, which binds to oxygen and carries it throughout our body to each of our cells. The octopus blue blood, on the other hand, uses copper instead of iron to carry oxygen. This comes with the added benefit of remaining functional in a wide variety of temperatures, which is particularly useful for ectothermic organisms. This is part of why octopuses have been found everywhere from the Caribbean to the Arctic circle. Hemocyanin does not, however, come without its costs. For one, it is highly sensitive to changes in pH. This means that if octopuses do not adapt quickly, they may be negatively impacted by the acidification of our oceans from the mass emission of carbon dioxide. In addition, hemocyanin is not as efficient as hemoglobin. This, along with their sophisticated brain, astronomical growth rate, and relatively active lifestyle, causes octopuses to have a massive metabolism, and consequently, require a lot of oxygen. In fact, while most other mollusks, as well as fish, require a 3% oxygen saturation in their blood, octopuses demand a hefty 11%. This has also influenced their evolution. To compensate for this gluttonous oxygen demand, their cephalopodan ancestors developed a closed circulatory system, while other mollusks maintained an open system. In other words, the blood of an octopus travels through capillaries to perfuse its tissues while snail blood simply mixes with the extracellular fluid. If this sounds too familiar, don’t worry, for they have not one, nor two, but THREE hearts. One brachial heart is paired with each gill and a third systemic heart pumps the blood throughout the rest of the body. As strange as this may be, we vertebrates had to optimize blood flow to keep pace with our energy demands as well. 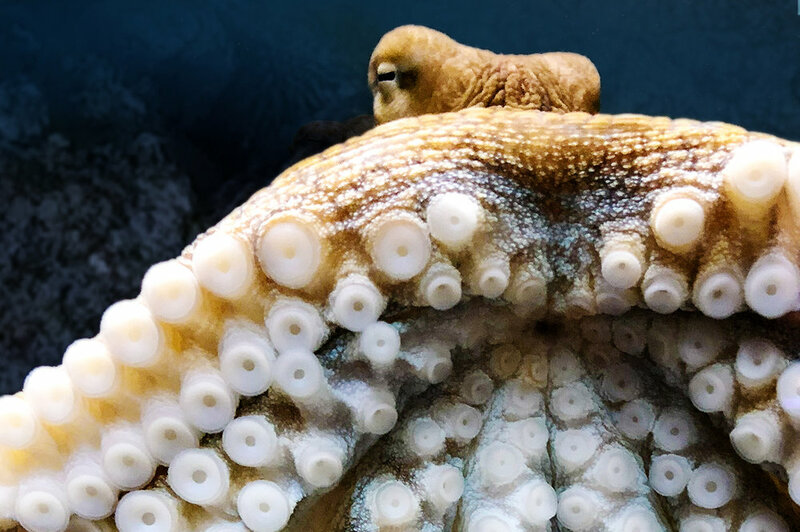 While we divided our hearts into chambers, keeping the oxygen-rich blood on the right side for maximum concentration, octopuses and their relatives developed entire separate organs for this same purpose. The blue blood of an octopus, along with its bizarre cardial anatomy, may evoke images of extra-terrestrials, and while this may be technically inaccurate, it is perhaps not far from the truth. After all, you would expect any organism that diverged from our lineage hundreds of millions of years ago to be drastically different from humans. But even stranger is that, despite all their differences, they still seem so eerily similar to ourselves. A Blind Rainbow - What Do Octopuses See, Anyway? Few things are more captivating than watching an octopus moving along the seafloor constantly changing its own appearance to match its environment, send warnings, and obscure its outline as necessary. What biological mechanisms could possibly make those brilliant colors flash so quickly? This mystery becomes even more compelling when we know that octopuses cannot see the colors themselves! The human eye possesses two types of specialized cells in the retina: rods and cones. Rod cells are the most sensitive and are specifically adapted to operate in low-level light. The downside of this is that they cannot differentiate between different wavelengths of light—that is, they detect only “grayscale” images. This is compensated for by the cone cells, which detect only particular wavelengths, thus enabling color vision. An octopus eye, however, lacks these cone cells. But wait—then their color changing should be impossible, right? Surely, they must have some way to detect colored light! This is a question we still cannot answer definitively, though there are a few guesses. One is that the eye lens accomplishes this for them through refraction, just like a rainbow. Rainbows are formed by raindrops in the air on a sunny day, which causes the light to bend differently as it passes through, separating it into the brilliant bands we see streak across the sky. It would be as if this rainbow were cast directly onto the retina, enabling octopuses to see colors, and by extension, construct equally dazzling displays on their own skin. Another possibility is that while their eyes are truly colorblind, perhaps the skin itself can see. This actually isn’t as crazy as it sounds; even jellyfish can detect some light (though this is not “sight” as we think of it, because they do not create an image). Some researchers have found that the chromatophores, the color changing cells, of an octopus’s skin actually do respond to some wavelengths of light due to the presence of a protein called opsin. This opsin is the same protein that detects the light in our eyes. So maybe the octopus isn’t even aware of the show it is putting on, or the beauty it possesses. Like Beethoven near the end of his life, the octopuses themselves may be the only ones unable to appreciate their own artistry. But hey, at least it keeps the eels away. Beauty Skin Deep - How Do Octopuses Change Color? After watching octopuses rapidly change their color several times each second, everyone has the same question: how do they do it? How dynamic is their skin? Can I get some octo skin for myself? Okay, that may be more than one question, but the amazement and wonder regarding their pixelated displays is surely genuine. As far as how they do it, there are actually a few different layers of their skin that all come together to make them even more incredible than we can sense. The most basal layer of octopus skin includes leucophores, which reflect any wavelength of light. This basically means that they are white, so we’ll skip to the topmost layer, which is responsible for all of the brilliance we actually see: the chromatophores. Essentially, these cells are sacks of pigment attached to some muscles spiking outward like the spokes of a wheel. These muscles control the size of that sack, making them wide and bold or shrink away to a minuscule dot. They can change their color at the speed of thought, which explains the lightning speed with which they disappear into coral or a rocky background. These pigments are generally red, yellow and brown, and provide an assortment of warm, dull colors to their repertoire. But wait, you may be thinking, I’ve seen blue rings on an octopus before! This chic hue comes from a far more interesting set of cells, the iridophores. These, like the leucophores, reflect light very well, but only at particular wavelengths, including silvers, golds, and greens. 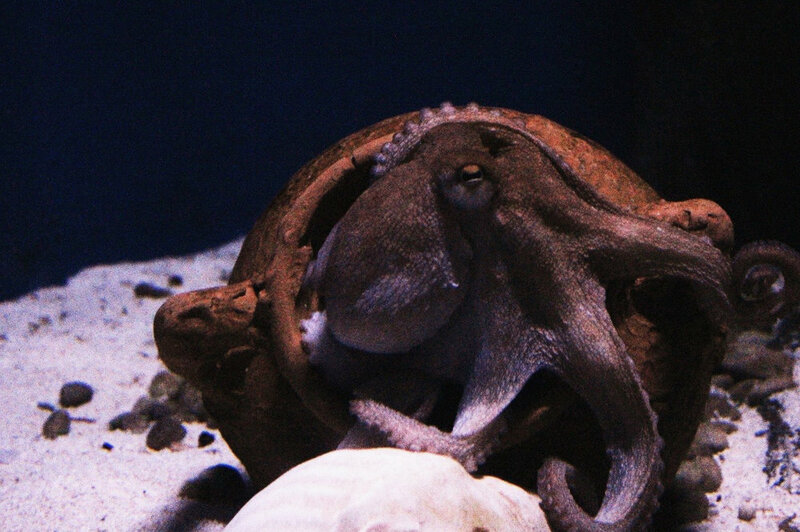 The wavelength they reflect also depends on the angle of the light, meaning that the octopus may be a different color depending on where the viewer, or camera, happens to be. As if this were not already enough, these cells also add a dimension to their displays that we cannot see: they can adjust how their skin interacts with polarized light. All light is composed of electromagnetic waves, but normally these waves vibrate haphazardly in every direction. Polarized light, however, oscillates only in a single plane, a nuance that we humans cannot observe. These can also be altered or adjusted, but they are under hormonal control, and are thus much slower. All of these layers serve to create the dazzling displays we see simulated on viral octopus videos or, if you may be so lucky, in the ocean itself. While some of the greatest mysteries in science may be the most difficult to notice, cephalopods do not pretend that their biology is dull in any sense of the term. A Toxic Bite - Are Octopuses Venomous? Even regarding octopuses, the old adage holds true: if it’s found in Australia, it can probably kill you. Specifically, the blue-ringed octopus packs enough venom in its bite to take down a person in minutes. What is the dastardly appearance of such a deadly creature? A tiny animal no more than 4 inches long, with a pale, yellow coloring and iridescent rings of blue. The major component of their defensive venom is a chemical known as tetrodotoxin, also found in some fish, amphibians, and shellfish. Tetrodotoxin binds to certain voltage-gated sodium channels, inhibiting their function. Because the action potentials of the nervous system are themselves generated and propagated by the movement of these ions, this is an extremely potent neurotoxin. Its victims may experience paralysis, nausea, numbness, and convulsions until the respiratory system completely shuts down. And if that isn’t bad enough, their saliva delivers it along with histamine, octopamine, hyaluronidase, and a slew of other fun chemicals to make an encounter with this octopus particularly memorable. 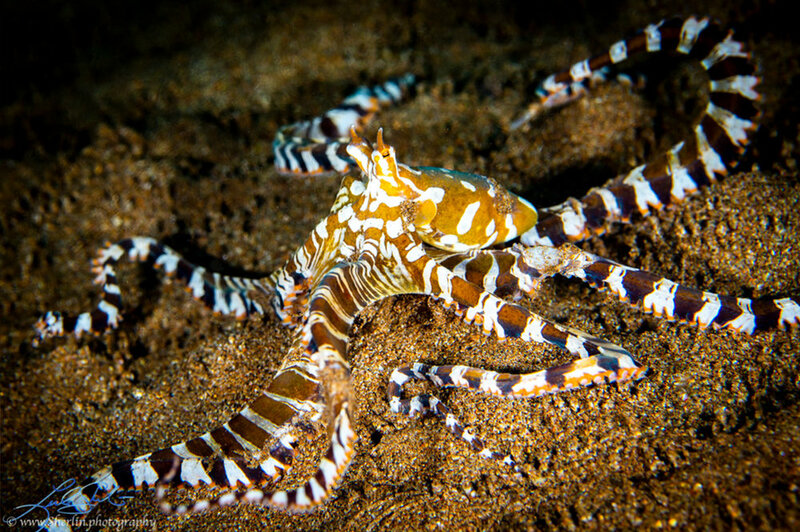 While the blue-ringed beauties are the only octopuses with a bite lethal to humans, all come with a venom in their saliva, though it is mainly used for predatory purposes, and you may have noticed evidence of this yourself. If you walk down a beach and notice a shell with a neat hole in it, that is likely due to the radula, or rasping tongue, of a mollusk, octopuses being included in that group. They then spit their venom into the prey to paralyze it, allowing them to enjoy an easy meal. If this is all a little too unnerving, it may be worth noting that they confine the use of this lethal power to hunting and defense-- they will not likely attack a human unprovoked. So, all octopuses have a certain amount of dark alchemy within them, but assuming you aren’t a crab, you don’t have much to worry about from the curious, squishy aliens of the deep.